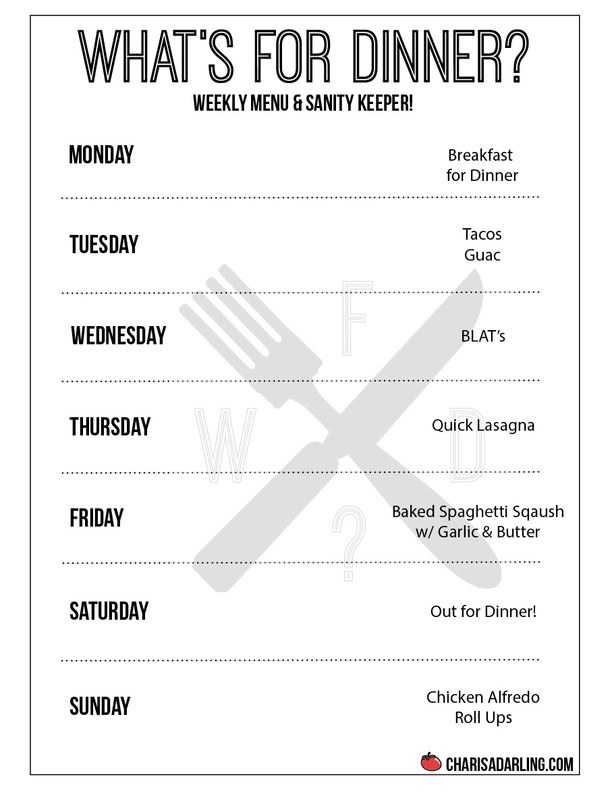 We had dinner plan changes for 2 nights last week, so we didn't get to the Chicken Alfredo Roll Up's and the Garlic and Butter Spaghetti Squash. I'm carrying them over to this week, but am already doubtful that I'll feel like cooking spaghetti squash on a Friday night. We'll see though, if not squash keeps, right?!? On Monday, I'll be a short-order cook and make breakfast for dinner - however the kids want their eggs. (Justin hates breakfast for dinner, so I'll make him something equally glamorous, like tunafish, or something like that.) It's a busy night and I don't know when we'll fit in dinner, but fingers crossed! Taco Tuesday! Normal beef tacos, beans, and guacamole. (To make this work on a busy night, I pre-cook the meat and make the beans and guac ahead of time. I stick the beans in the oven and use the delay cook function and just keep the meat covered on the stove. Justin gets home with home with one kid before I do, so he gets things going and finishes up for when I get home with the other kiddo. Teamwork! Wednesday is another busy night, but I'm planning on making BLAT's. 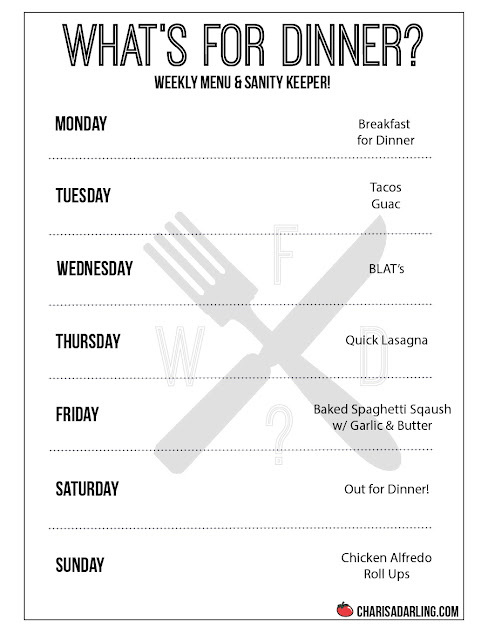 On Thursday, I'm planning on making a quick lasagna using a crock-pot. Vance loves lasagna roll-ups, but they take so much time to individually roll up each noodle. I've convinced him this will be the same thing, just a different shape! I don't have a particular recipe that I'm following, I think I'll just wing it as I go. Carrying over the Garlic and Butter Spaghetti Squash from last week for Friday. Sides TBD. Kitchen is closed on Saturday! Carrying over the Chicken Alfredo Roll Up's from last week for Sunday. I'll make a salad or something to go with.